Underwater noise: Death knell of our oceans? United States District Court Judge Florence-Marie Cooper issued a temporary restraining order blocking the use of high-intensity, mid-frequency sonar by the US Navy during Pacific war games now taking place in waters around Hawaii. The court's order comes three days after the Pentagon took the unprecedented step of declaring the Navy exempt from US law requiring steps to avoid harm to marine mammals. The Natural Resources Defense Council (NRDC) and other organizations filed suit, saying that use of mid-frequency sonar during the Rim of the Pacific (RIMPAC) 2006 naval exercises posed an unnecessary and avoidable threat to marine mammals. 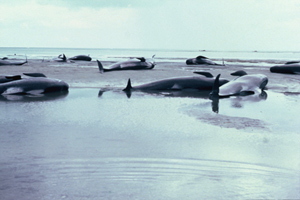 Mid-frequency sonar has been directly associated with repeated occurrences of mass strandings and deaths of whales, dolphins, and other marine species. The NRDC suit claimed that sonar use violated two fundamental environmental laws: the Marine Mammal Protection Act (MMPA) and the National Environmental Policy Act (NEPA). The plaintiffs had tried, unsuccessfully, to work with the Navy to develop protective measures for use during the exercise. "We are pleased, but not surprised, by the court's emergency intervention. This ruling underscores that no one, not even the United States military, is above the law," said Joel Reynolds, director of the NRDC Marine Mammal Protection Project. "We've requested and the court has ordered that the parties meet and confer, and we are prepared to begin that conversation immediately ", said Richard Kendall, partner at the law firm of Irell & Manella which is serving as co-counsel to NRDC. On June 30, the Navy received an unprecedented exemption from the Department of Defense granting it permission to ignore the MMPA for six months in its use of sonar. The MMPA is this country's foremost law protecting marine mammals from "take," a legal term meaning to harass, hunt, capture or kill. The issuance of this Temporary Restraining Order ... serves the public interest by ensuring the protection of endangered marine species threatened by the Navy's proposed MFA sonar training and testing activities ...". The court ordered that "the Navy is hereby enjoined from using mid-frequency active sonar during its Rim of the Pacific 2006 training exercise...for 10 court days from the date of this Order, pending a hearing on the Order to Show Cause why a preliminary injunction should not be granted." 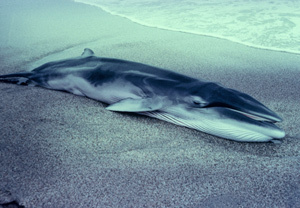 A stranded Minke whale Balaenoptera acutorostrata on the South Island of New Zealand. There have been more whale strandings in New Zealand than any other country. Image Crown Copyright © Department of Conservation. RIMPAC naval exercises involving 35 surface ships, six submarines, 160 tactical aircraft, and amphibious forces from the United States, Australia, New Zealand, Japan, South Korea, Chile, Canada and Great Britain, will continue without mid-frequency active sonar. "Exercise participants will attempt to find submarines by listening with passive sonar and visually searching with aircraft and from surface ships" said Vice Admiral Barry Costello, commander of the U.S. 3rd Fleet. RIMPAC 2006 is taking place in a 210,000 square nautical mile area around Hawaii, comprising some of the richest marine habitat in the world, including waters near the newly established Northwestern Hawaiian Islands Marine National Monument, created just two weeks ago. Under the original authorization for sonar use during RIMPAC 2006, issued by the National Marine Fisheries Service (NMFS), the Navy had been allowed to "take" as many as 25,000 protected marine mammals by blasting high-intensity, mid-frequency sonar during the biennial naval exercise. Despite a recent report by NMFS saying that sonar was a "plausible, if not likely" cause of a mass stranding of 150 melon-headed whales during RIMPAC 2004, the Navy had steadfastly resisted adopting any significantprecautions for mid-frequency sonar use during RIMPAC 2006. Such measures include establishing a larger, permanent safety zone around mid-frequency sonar sources, as the Navy uses for other sonar systems; adding an extra marine mammal spotter on board ships during all sonar training; reducing the sonar power level at night or at other times when spotters' visibility is compromised; and avoiding areas in or near significant marine mammal habitat, like whale breeding and feeding areas, and migratory routes. Whales exposed to high-intensity mid-frequency sonar have repeatedly stranded and died on beaches around the world (including Hawaii, Washington State, North Carolina and the Bahamas), some bleeding around the brain and in the ears, with severe lesions in their organ tissue. At lower intensities, sonar can interfere with the ability of marine mammals to navigate, avoid predators, find food, care for their young, and, ultimately, to survive. There is no scientific dispute that intense sonar blasts can disturb, injure, and even kill marine mammals. Biologists worry that whales found dying on beaches are only the tip of an iceberg, and that many more are dying at sea. One of the best-documented incidents took place in the Bahamas, in 2000, when 16 whales of three species stranded along 150 miles of shoreline as ships blasted the area with sonar. The U.S. Navy later acknowledged in an official report that its use of sonar was the likely cause of the stranding. The lawsuit was brought by NRDC in conjunction with the International Fund for Animal Welfare, the Cetacean Society International, the Ocean Futures Society, and Jean-Michel Cousteau.